Great Package should storage in 18-20’c & 45-50% Moistured Position in a partial sun location and remember to water moderately. Try to keep the ph of your soil between the range of 5.8 and 6.8 as Winter melon likes to be in weakly acidic soil. Keep in mind when planting that Winter melon is thought of as tender, so remember to wait until your soil is warm and the night time temperature is well above freezing before moving outside. See our list of companion Plants for Winter melon to see which plants you should plant in close proximity to encourage growth. 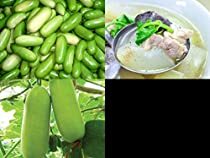 Growing Winter melon from seed (The following is written from a UK perspective)… Seed – sow March/April in a greenhouse. Germination should take place within 3 weeks. When they are large enough to handle, prick the seedlings out into individual pots and grow them on fast in a rich compost in the greenhouse. Try to maintain a minimum night temperature of at least 10?c for the seedlings first few weeks. Plant out in May/June after the last expected frosts1. Transplanting Winter melon Ensure that temperatures are mild (minimum night temperatures should be around 25’C / 77’F) and all chance of frost has passed before planting out, as Winter melon is a tender plant.